For “years and years,” parts prices had been delivered through a “price tape” — a file of list prices disseminated by Ford to the marketplace, according to Boyer. The tapes were released monthly, and no prices could be changed until it was time to release the next month’s file, she said. “It’s very inflexible,” Boyer said. Given technological advancements and Ford’s dedication to innovation, “it’s really time for us to modernize the way we bring pricing to the market,” Boyer said. MyPriceLink allows an automaker to adjust component list prices as frequently as they’d like and have the new prices appear seamlessly before collision repairers using any of the three major estimating systems — possibly enabling greater competitiveness with alternative parts. The system was pioneered in 2015 and is still in use today by General Motors, which developed the software with current owner OEConnection. In addition to offering Ford “much greater flexibility,” MyPriceLink allowed Ford to “protect the information to a greater degree,” according to Boyer. The “price tape” was available to too wide an audience, she said. Boyer confirmed the list prices will flow into estimating systems seamlessly, as was the case in 2015 when GM adopted it. “It’s really fairly transparent for repairers,” she said. 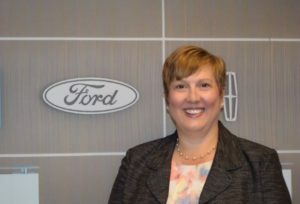 Ford has been testing the system ahead of the Nov. 1 target date, and “it’s gone very well,” she said. The OEM has delivered a dynamic price over-the-air. “That could adjust over time,” Boyer said. She said she didn’t have a specific number. We asked if Ford would launch MyPriceLink with just a few parts fluctuating dynamically and grow the portfolio over time. Boyer replied that that the system was flexible and noted that once Ford made a decision to include a part, there was “no real going back,” for the price tape would list a $0 value. Boyer said MyPriceLink would complement how Ford competed on the market today and not replace any of its existing programs. She said she didn’t view it as a catalyst for price erosion.